Anti-Müllerian Hormone (AMH) levels can help determine how many healthy eggs a woman has in her ovarian reserve. Our fertility doctors at Fertility Center of San Antonio can test your AMH levels to assess the number of viable eggs available for in vitro fertilization (IVF) or Nature’s IVF™ treatments. At our San Antonio, TX, practice, we use AMH testing, combined with other ovarian reserve tests, to establish candidacy for our treatments and formulate your fertility treatment plan. Blood tests are an effective way to assess your ovarian reserve. 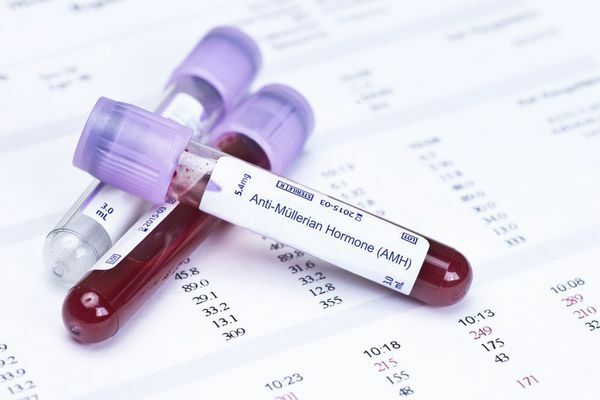 Anti-Müllerian Hormone levels correlate with ovarian follicles, meaning that checking blood levels for AMH is a reliable method of measuring a woman's ovarian reserve. As a woman ages, ovarian follicles counts and AMH levels decrease. A woman close to menopause will have very few remaining follicles and correspondingly low AMH levels. Conversely, women with polycystic ovarian syndrome (PCOS) will have small ovarian follicles and high levels of AMH. Normal AMH levels depend on your age; ranges considered normal will be lower for older women. AMH is produced by the granulosa cells in developing ovarian follicles, also known as egg sacs. These early follicle stages cannot be detected by an ultrasound, making blood work necessary to evaluate AMH levels. Since AMH levels in the blood do not fluctuate much, the test can be performed at any time during the menstrual cycle. Research has shown that women with normal AMH levels respond better to ovarian stimulation and have more eggs retrieved in IVF. Producing more eggs during IVF egg retrieval makes it more likely a woman will have at least one high quality embryo available for transfer. However, AMH levels do not indicate egg quality. Normal AMH levels correlate with higher follicle rates, greater number of eggs retrieved, a higher chance for freezing embryos, and higher live birth rates. Women with low AMH scores alone can still achieve live birth through IVF. In women under 35, low AMH levels by themselves do not predict low IVF success rates. Since AMH decreases with age, a normal range is age-dependent. Your doctor can help put your AMH score into context by taking your age and other factors into account. Anti-Müllerian Hormone testing is only one method to evaluate remaining egg supply. Our team uses this test to determine candidacy for IVF, as well as our advanced Nature's IVF treatment. However, no single test can offer a complete picture of ovarian reserves. As such, our fertility specialists often use a combination of tests to arrive at as close of an estimate as possible concerning ovarian reserve. Your doctor will likely order other types of blood work and tranxsvaginal ultrasounds to get a better idea of your egg supply. Learning more about the health of your ovarian reserve can help our doctors design a personalized treatment plan. Call us today at (210) 692-0577, or fill out our online form to find out more about AMH testing and the other fertility tests we offer.